The Miami Trace wrestling team is pictured after winning a Division II Regional championship in the State Dual Team Tournament Wednesday, Feb. 1, 2017 at the Miami Trace Middle School. 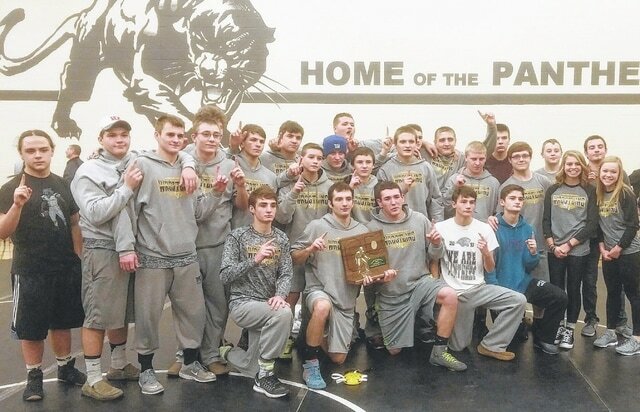 The team competes at the State tournament at St. John Arena Sunday, Feb. 12 at 11 a.m. The Miami Trace High School wrestling team has made school history by winning a Regional championship in the dual team tournament. On Wednesday, Feb. 1, the Panthers hosted the Regional semifinals and finals matches at Miami Trace Middle School. The Panthers first took on the Logan Elm Braves and won a very close match, 39-35. In the other Regional semifinal, Whitehall-Yearling defeated Upper Sandusky, 46-24. In the finals, the Panthers beat the Rams, 39-30. Miami Trace advances to the State dual team tournament which will be held Sunday, Feb. 12 at the legendary St. John Arena on the campus of The Ohio State University. The Panthers are the No. 8 seed in Division II and have the challenge of facing right off the bat on the best programs in Ohio in the No. 1 seed St. Paris Graham Falcons. Miami Trace and St. Paris Graham will wrestle at 11 a.m. on mat 3. The winner of that match will face the winner of No. 5 Western Brown vs No. 4 Mentor Lake Catholic. Moving down, to the bottom part of the Division II bracket, the No. 3 seed, Carrollton will meet No. 6 Ashland at 1:15 p.m. and the winner of that match will take on the winner of the match between No. 7 Peninsula Woodridge and No. 2 Wauseon. In the Regional semifinals and finals, Miami Trace had four wrestlers go 2-0. Bladeth Leamon (145), Jack Anders (170) and Jared Fenner (195) each had two pins. Coby Hughes had two wins by decision at 132 pounds. Storm Duffy (106), Dylan Murphy (138), Dereck Moore (152) and James Munro (160) each picked up one pin for the Panthers. Colin Wolffe won a decision at heavyweight. “The kids brought the intensity that we’ve been looking for them to bring,” Miami Trace head coach Ben Fondale said. “This was probably the most heart, the most intensity, the most emotion with which they wrestled the whole year. “We talked to the kids about being the first team to go to St. John Arena,” Fondale said. “These State duals are relatively new. We talked to them about making history and they came and brought it. They did everything we asked them to do. The SCOL tournament is Feb. 18 at Hillsboro High School, with the Sectional tournament Feb. 24 and 25 at Washington High School, then the District tournament March 3 and 4 and the State tournament March 9-11.